After getting traded from Houston to Milwaukee, Seth’s having a tough time keeping his head in the game, let alone making sure that his daughter is fitting in. So if the only nanny that Madison will tolerate is a grown woman who likes comic books even more than she does... well, so be it. Too bad the nanny is also the gorgeous redhead Seth’s been flirting with all this time. But with Carrie’s knowing glances and kissable lips driving him wild, Seth must decide whether he’s ready to put everything on the line. I thoroughly enjoyed this book. The sparks between Carrie and Seth are off the chart and it’s easy to see how the sexual tension plays a major role in this book. The ups and downs of single parenthood are well written and it’s easy to see the difficulties they face when trying to balance what's best for the children vs having a personal life. This is the first in a new series, and I think it bodes well for future books. It is sports based, but as Seth doesn't get out much, we only briefly meet teammates. I felt that the fact that Carrie is a soon-to-be-evicted, unemployed teacher in a jam, rather than a career nanny, did make the whole story a lot more interesting. She was older and more experienced than the average nanny, and the connection through her brother played a part in her getting the job. It also added the pressure on them not to get involved in any way. And whilst their attraction was immediate and stronger than one might expect, the very fact they couldn't act on it clearly made it worse. It was fun watching on – especially at the cosplay convention. Given that the story needed to get through a whole season, there were some time jumps which I also think made the intensity of their feelings and the acting on them more realistic. Overall, this was a sweet read about a single dad travelling in uncharted waters with a tween and trying to keep her happy beyond everything else. His heart was in the right place, and in the end, he learned a valuable lesson which ensured that we got the happy ending we wanted – well happy for now, assuming we will get more in future installments (please)! This was a cute story – I love that it starts out with a clueless single dad trying to pick out tampons for his young teen’s first period, it was an intriguing way to start the story and had me sucked right in. Seth is a professional athlete who has just been traded from Houston to Milwaukee, his 12 year old daughter, Madison, isn’t taking the move well at all. Seth is struggling to find her a nanny when the perfect person makes an appearance – Carrie. Carrie is an out of work teacher and an all-around geek who loves science. She and Seth’s daughter hit it off from the get-go with their mutual love for all things nerdy. Unfortunately for Seth, Carrie isn’t willing to mix business with pleasure and though the two send some super-hot texts back and forth, Carrie isn’t willing for there to be a relationship while she’s nannying his daughter. I read a lot of sports romances and really love the originality of this one – it’s not the same overdone story. Carrie is one of my favorite characters that I’ve read in a long while – she’s very relatable and has a quirky personality that I enjoyed reading. I’m looking forward to more from this author! 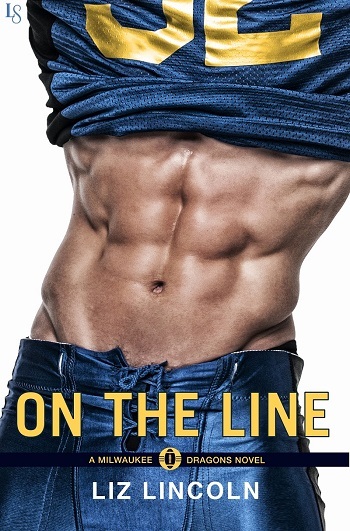 Reviewers on the Wicked Reads Review Team were provided a free copy of On the Line (Milwaukee Dragons #1) by Liz Lincoln to read and review.